Degenerate rock lives tonight at the Factory with Iggy Pop and the Stooges. An interview. 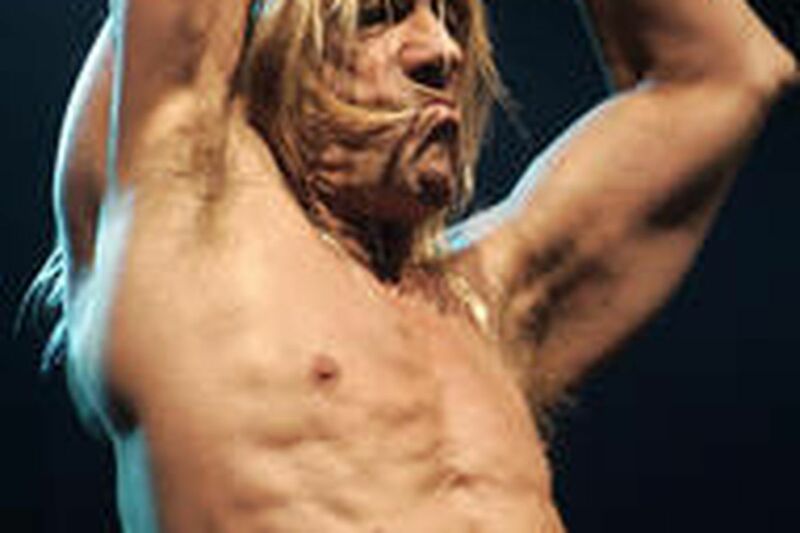 Ripped in the Netherlands: Iggy Pop performing in August. "I do about 40 minutes a day of exercises of a Chinese origin called qi gong." James Osterberg is on the line, calling from his home in Miami where he's resting up before returning to the road in his role as the most feral front man in the history of rock-and-roll - as a guy called Iggy Pop. He may be inching toward the retirement age of his fellow Floridians, but Iggy's not quite ready for his Social Security check. Along with original band members Ron and Scott Asheton, plus bass player Mike Watt and sax man Steve MacKay, he's just released The Weirdness, the first new album by the Stooges in 34 years. Back in the day, the nasty and brutish band's songs such as "Search and Destroy" and "I Wanna Be Your Dog" did more to make rock-and-roll safe for degenerates than anyone this side of the Velvet Underground. And while Iggy is no longer self-destructive privately - today fine French wine is his strongest vice - he's still a shirtless, untamed beast on stage. The Weirdness is not a particularly masterful return to form, but the Stooges' performance last month at the SXSW festival in Austin, Texas, was a complete triumph, and fans of truly savage, gloriously unkempt hard rock will live to regret missing the band at the Electric Factory tonight. Question: Why do the Stooges make sense for you now? Answer: I never made a conscious decision. It just kind of snuck up on me. It might be known to an astrologer or a gypsy, or some sort of religious authority might be able to figure out the significance of it, but it occurs to me that I'm doing it now because I can, basically. From about '76 to '95 I was going out playing whatever record I had at the time, and two or three Stooges songs, and it was getting a bit boring. I was by choice working with a bunch of young musicians who were friends of my son who were like a knuckleheaded version of the Stooges. . . . And it was probably cosmically correct at that point: Why not just do the real thing? Q: So much is made of how the Stooges prefigured punk, and were ahead of their time. What were you hearing in the late '60s that made you want to play in a band that was so raw and primal and aggressive? A: I had pretty well absorbed the best of the British bands circa '65 to '70 and what they were doing, which was taking the great American hillbilly and black music that America had totally rejected, to make Perry Como records. . . . They rejected this music, and gave it away. Threw it away, and gave it to these English people to sell back to us! And what a shame! Shame, shame, shame on you, America for that! If you put all but the Beatles to one side, and you get the Stones, Kinks, Them, the Who and several others . . . what they were really good at was sneering [laughs]. . . . They all did a great sneer. In America, among the better groups, nobody had dared do that since Elvis, and all the groups were tamed. . . . Which usually meant some sort of hippie buckskin suit, fake peace-and-love song, manager-strategy-session deal. . . . So I looked at all that, and also the folk music of America, and the folk musics of the rest of the world. Gamelan music, Indian sitar instrumental music and belly-dance music, those three in particular. We basically had a bunch of guys who had little or no musical doodling proficiency, and I thought, "How much of that is doable to us?" And that's what we came up with. I never thought there'd be a big audience. I thought, maybe there'll be 50 people who are interested in it. And that was great for me. I was just a guy who wanted to be a musician. . . . You know, every once in a while we'll be playing live and something will sound good, and I'll go . . . "I'm getting pretty good here." You know, that's a wonderful feeling. That's kind of what I got into it for. To see if I could do something that sounds good. Q: You turn 60 next week, and you're rather ripped. How do you keep your girlish figure, Iggy? A: I do about 40 minutes a day of exercises of a Chinese origin called qi gong. You can do them in a bathroom in a pinch. It's like tai chi. I try not to totally pig out at all times, and try to go to bed early. And I try to anticipate all my perversions and lusts and take care of them efficiently. That seems to work for me. Q: Is there still a James Osterberg place you go to? Or are you always Iggy Pop? A: I definitely go to James Osterberg places all the time. I answer his mail. I'm him at the bank. Given the era I came up with it, my stage name was particularly daring and provocative. Rappers have really helped me out on that one. Q: Were you conflicted about selling your song "Lust for Life," which contains the line "of course I've had it in the ear before," to be used in a TV commercial for Carnival Cruise Lines? A: No, I feel great about that. It suits me. For one thing, I think my few long-suffering fans are happy for me . . . and whether it's my solo stuff or the Stooges, when you hear it, it'll still hurt your ear. It still sounds spiky. I got laughed off and blown off by people who thought they had a lock on the media for 30 years. And these are the people who stole rock-and-roll, who wrote songs that were disguised as music that were actually already commercials! Well, f- you buddy! No, I feel great about it. Contact music critic Dan DeLuca at 215-854-5628 or ddeluca@phillynews.com. Read his blog, "In the Mix," at http://go.philly.com/inthemix.